Super substitute Demba Ba slide home Chelsea's second goal to secure a semi-final place. Ba bundled the ball home in the 87th minute to secure a 2-0 win in the quarter-final, second leg at Stamford Bridge that sent the London club through after a 3-3 aggregate draw. Jose Mourinho's touchline dash after Chelsea scored the goal that clinched their Champions League semi-final place on Tuesday was not done just because he wanted to celebrate with his players by the corner flag. The coach explained he had something else in mind. "I didn't go to the corner flag to celebrate," Mourinho told reporters at Stamford Bridge. "I went to tell them the changes we had to make. There were three minutes plus added time left and the way we were playing was too risky. "I wanted Demba Ba to play in front of the defenders and (fellow substitute striker) Fernando Torres to defend (PSG's) Maxwell. I tried to use them in different jobs." Mourinho was not prepared to waste a moment securing the win against PSG as he stayed on course to become the first man to lift the European Cup with three different clubs after his triumphs with Porto in 2004 and Inter Milan in 2010. Branislav Ivanovic will miss the first leg of Chelsea's semi-final after picking up a booking at Stamford Bridge on Tuesday night. Chelsea midfielder Eden Hazard was also forced off with an injury early in the first half. He was replaced by Andre Schurle. 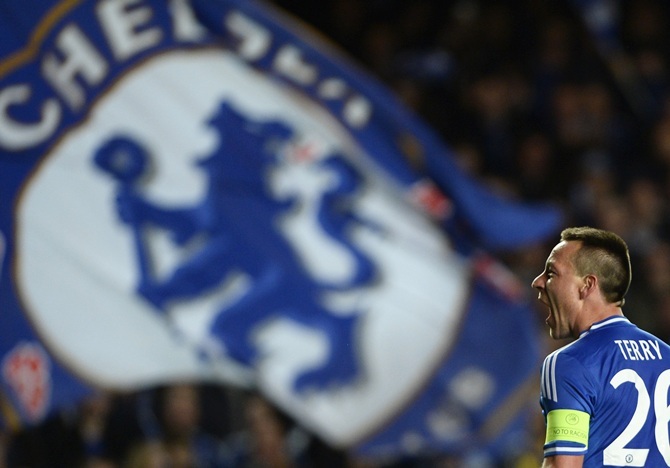 Frank Lampard and John Terry are the leading players in English football for over a decade. They have earned their seventh Champions League semi-final. The two had their won way of celebration. Two first half goals by Marco Reus, both coming from Real mistakes, gave Dortmund a deserved lead as the Spaniards, who had a penalty saved in the 17th minute, were left mesmerised by the Germans' frantic pace on a rainy evening in the Ruhr valley. But an astonishing comeback was not on the cards. Real squandered a golden opportunity to take the lead and put the tie all but beyond the hosts when they were awarded a penalty for a handball by defender Lukasz Piszczek and Angel Di Maria had it saved by Roman Weidenfeller. Dortmund missed a great chance to level the tie in the second half when Armenian Henrikh Mkhitaryan rounded Madrid keeper Iker Casillas but only managed to hit the post.